Please join the people of Al-Walaja for their weekly demonstration this Friday morning: December 24, 2010 at 9 a.m.
A resident of al-Walaja is attacked with pepper spray for confronting Israeli bulldozers. Despite an ongoing trial in the Israeli high court over the legality of the placement of the Separation wall in al-Walaja, a small village just outside of Jerusalem, Israel doubled construction efforts this afternoon. 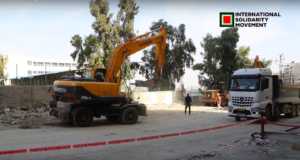 Around 2pm bulldozers accompanied by armed guards started clearing trees, rocks, and shrubs. Three days ago, Israeli authorities marked the wall route with orange plastic straps which including a route which will swallow a natural spring and a Palestinian grave yard. Last August, a group of villagers, members of the Israeli nature preservation society and even settlers brought a case before the Israeli high court demanding that the route of the wall be changed. The court said that it would take time to deliberate the case and deliver a final verdict in January. The court, however, did not issue a stop work order on construction of the wall. 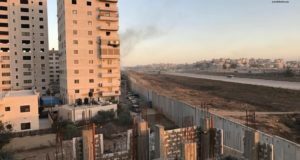 Israeli authorities are now taking advantage of this loophole by doubling work on the construction of the wall in order to create facts on the ground. This afternoon, villagers and international supporters walked towards the active bulldozers and tried to stop their work non-violently. They were prevented from reaching the bulldozers by armed Israeli soldiers, border police, and riot police. Despite the violent show of force, villagers argued that Israel had no right to destroy their land and cited the ongoing High Court legal case. 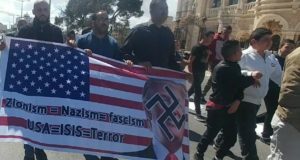 At one point, an IDF commander recognized Professor Mazin Qumsiyeh from an earlier demonstration which took place in the summer. Qumsiyeh was standing in a group of people when he was suddenly arrested without the slightest warning or provocation. The army then started to violently push the crowd into the village, causing several villagers to fall on the rocky, uneven ground and sustain minor injuries. As the outnumbered villagers were being pushed further and further away from the construction zone, a commander suddenly ran into the crowd and randomly detained several Palestinians who – at that point – had their backs turned to the soldiers and were facing towards the village. In total, eight Palestinians – one woman and seven men including teenagers and an elderly men, were detained. Three were handcuffed; five were bound with plastic zip ties which resulted in minor injuries due to the tightness of the plastic. Three of those detained continued to take abuse from the soldiers even after their arrest. Al-Walaja is an agrarian village of about 2,000 people, located south of Jerusalem and West of Bethlehem. Following the 1967 Occupation of the West Bank and the redrawing of the Jerusalem municipal boundaries, roughly half the village was annexed by Israel and included in the Jerusalem municipal area. The village’s residents, however did not receive Israeli residency or citizenship, and are considered illegal in their own homes. Once completed, the path of the Wall is designed to encircle the village’s built-up area entirely, separating the residents from both Bethlehem, Jerusalem, and almost all their lands – roughly 5,000 dunams. Previously, Israeli authorities have already confiscated approximately half of the village’s lands for the building of the Har Gilo and Gilo settlements, and closed off areas to the south and west of it. The town’s inhabitants have also experienced the cutting down of fruit orchards and house demolition due to the absence of building permits in Area C.
According to a military confiscation order handed to the villagers, the path of the Wall will stretch over 4890 meters between Beit Jala and al-Wallaja, affecting 35 families, whose homes may be slated for demolition. Beit Jala is a predominantly Christian town located 10 km south of Jerusalem, on the western side of the Hebron road, opposite Bethlehem. Once completed, the Wall will Isolate 3,200 Dunams of the town’s lands, including almost 3,000 Dunams of olive groves and the only recreational forest in the area, the Cremisan monastery and the Cremisan Cellars winery.